How can I manage cancellation and guarantee policies? HOME > SETUP AREA > How can I manage cancellation and guarantee policies? STEP 1: First you need to go to SETUP > PAYMENTS > CANCELLATIONS AND GUARANTEE. STEP 2: By default the system provides you with two cancellation policies: "48hours" and "Non refundable" ( These cannot be deleted from the system). By default, the "48 Hours " Cancellation Policy is settled for canceled bookings and/or "No Shows", applying automatically a 1 night fee. STEP 3: The Hotel can set create new Cancellation policies, and add it to their Room types, Promotions and Special Offers. To create a new cancellation and guarantee police, please click on the button. Installments - to be used when integrated with a "Payment Gateway" - parcial payments. In order to set up Installments on your payment method, click here. Cancellation Policies - The text describing the policy. E.g. For a full payment of the reservation if cancellation is made 5 days prior to checkin date then it should be like the image above. Can be set by %, by number of nights or by a fixed fee (€). Guarantee Policy - Text to describe more details about the guarantee. Deposit Rules - The behavior and setup of the deposit. E.g. 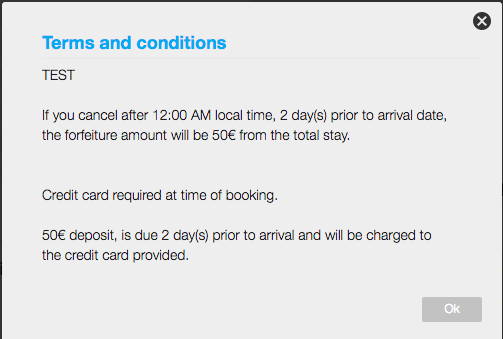 For a deposit of the full amount of the stay if the reservation is done 15 days prior to checkin then it should be done like the image above. Can be set by %, by number of nights, Fixed fee (€) or daily rates. STEP 5: Make sure you save all information entered by clicking on the button. When clicking on "Non-refundable" checkbox, the "1st Condition" option will disappear and hoteliers just have to set the deposit rule wanted. All policies can be checked on the booking engine, by clicking "I accept the Terms and Conditions" on the "Complete your reservation" window. Please note that after a cancellation and guarantee policy is created you can only change the Cancellation and Guarantee descriptions, not the rules. In order to have all the room types and promotions with the right policy, you must set the policy you want as default, just by clicking in "Set as Default". Remember that when creating a new room or promotion the "default policy" has been assigned by default. In order to translate the cancellation policies, click here.